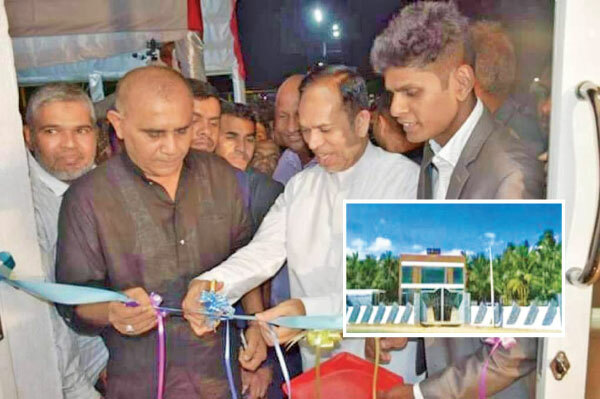 The Ainah Beach View Garden has been opened at Ferial Ashraff Beach Road, Akkaraipattu-13 in the Ampara district by the Chief Guest on this occasion Eastern Province Governor Dr.M.L.A.M.Hisbullah recently. The Akkaraipattu Ainah Beach View Garden Chief Executive Officer (CEO) M.I.Ajmeer presided over the unveiling ceremony. Among the facilities are a spacious garden, luxury rooms, conference hall, wedding hall, children’s park and restaurant etc. The main objective of opening the hotel is to entertainlocal as well as foreign tourists . Former Minister and National Congress (NC) Leader A.L.M.Athaullah, Parliamentarian Dr.S.M.M.Ismail, Akkaraipattu Municipal Mayor Athaullah Ahamed Zackie, Akkaraipattu Pradeshiya Sabha Chairman M.A.Razeek, Akkaraipattu Police Station OIC K.M.A.K.Bandara, Government and Private sector high ranking officers and members of the business sector all participated at this function.